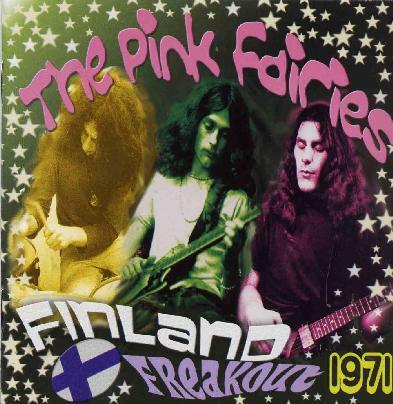 Pink Fairies - "Finland Freakout 1971"
Wow..What a major gem of a find. This group of drugged out rockers played a spaced out high energy set of raw, raw, freak rock. It all begins with a special distorted and twisted version of Tomorrow never Knows by the Beatles. Next up is a cool version of the Snake, a song they have played since the early days. TANK covered this one in the early 80's as well. Really distorted and nasty sound, these guys were so raw. Next up is the 20 minute and only original track on the CD, Uncle Harry's Last Freak Out. A really grunge rock and roll song and the bass is so nasty. Paul does a long freaked out noisy guitar solo as well. The track gets slow (for a few minutes) and spacey at the end. Intense. The CD ends with Walk Don't Run, at 13 minutes! While these guys are not virtuoso players, they make up for it in their totally raw, distorted and nasty style of playing that just cuts straight to the bone. Far out band. This was my favorite line up of the band.